Rhodri is 15 years old and has been shown as a 4 and 5 year old. 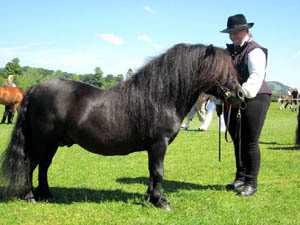 He came third at the Breed Show in 2007. His 2008 results are shown below. 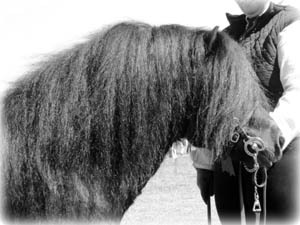 He successfully covered one mare in 2007 and two more in 2008. He has been successfully over the last few years and will be show again this year. Shropshire Horse Show -May 12 1st open Stallion and Reserve Standard Champion. 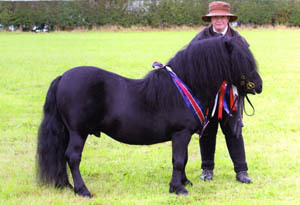 Severn Valley WPCA June- 12 - 2nd mixed M&M small breeds and best Shetland. Severn Valley WPCA June 14 -1st Standard Stallion and Champion Standard. Photos by taken by Lydia Millichap.